Choosing a guitar teacher makes the difference between succeeding and completely failing and never picking the guitar back up again. 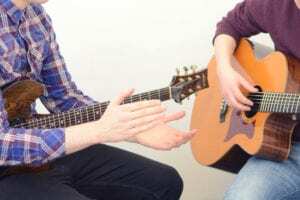 The following advice could save you a load of time and money by helping you pick the right guitar teacher to help you learn to play the guitar. What do you want to do on the guitar? What sort of style do you want to play? What sort of guitarist do you want to become? These are the kinds of questions to think about when looking for a guitar teacher. Generally, you want to go for someone who is a specialist in what he does. Anyone who says he can teach any style probably can but not as well as someone who is a specialist in a certain area. If you want to be able to play rock music, then choose a specialist who knows how to teach rock music. If it is jazz, then choose a specialist in jazz. If you are a beginner, then find someone who knows how to teach beginners. Not all teachers are the same, and not all musicians are the same. Everyone’s approach to teaching differs, and it is important that you find someone who will work well with you. 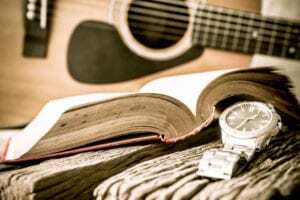 This question is a common one that people ask, the answer to which is a part of one’s decision-making process when looking for guitar lessons. Generally speaking, guitar teachers who are good, who get you results, cost more because there is more value in what they do. Generally, cheaper guitar teachers are not as good at getting you results. Make sure when you are choosing a guitar teacher that you make the decision based on what she can do for you. Even if it seems to cost more, you will actually save time and money in the long-term. You could do cheap lessons for five years, but a great guitar teacher could get you the same results in a year. Are you able to be coached by your teacher? Can you see yourself being coached by this person? Will you take his advice, trust what he has to say, and actually do what he has asks you to do? These questions are important to answer because if you question what your teacher is doing or are unsure of the method he is using or the path he is taking you on. You might double check on YouTube to see if what your teacher has told you is right. Doing this is wasting your time! You need to be coachable and accept that your teacher is a master of his craft. On the other hand, you need someone who is not only a master but is also able to teach you, someone you have respect for and trust that he can get you the results you are looking for. Will your instructor teach you how to practice? Practising is one of the most important parts of becoming a better musician, even to just getting out of a beginner stage and going past barre chords. Practising makes such a big difference to the amount of progress you make. Generally, you will spend less time with your teacher compared to practising at home. You want someone who knows how to practice well and knows how to teach you to practice. Many teachers drop the ball on this aspect, but there are great teachers who can help you with this. When you have learnt how to practice properly from your instructor; It will be like sticking a jetpack to your car, and it will propel your playing to new levels. This information will speed up your progress massively. Can you see results from your instructor’s students? Seeing results from your teacher’s students is very important; maybe she can refer you to one of her students. Talk to these students about what their playing was like before they started lessons and where they are now. Alternatively, ask to see before and after videos of your teacher’s students to see the results the students have achieved. When most people look for guitar lessons, they look at how good the teacher is at playing the guitar. However, this factor is one of the less important parts of a great teacher. (Also, it is hard for beginners to spot good players from great players). You need someone who can get results from you. One way to find that out is by looking at the results he or she has helped other students achieve. You instructor’s job is to turn you into a great guitar player. Get in contact with the teacher, sit down with him, and find out what he is like. See if you get on with him, if you believe that he can help you. If you do not feel comfortable, your results will be hindered. That confidence and certainty will help you progress faster. What experience does your teacher have? It is important to find out how long your teacher have been teaching. You do not want a beginner guitar teacher. It is great that everyone has to learn at some point; however, most people learn through testing on guinea pigs, and you do not want to be that guinea pig. If you want good results, find someone who has been teaching for a while and someone who has invested in educating themselves in guitar teaching. At least three years is a good benchmark. You want someone who has taught many guitar students, so he/she has an idea of how to teach different types of people. Everyone learns in a slightly different way, but the more people your teacher has helped, the easier it is for her to help you with your playing. Looking for an experienced teacher should protect you from wasting time and money when it comes to learning the guitar. When choosing a guitar teacher, there are many factors to consider. You want a guitar teacher that is going to get results for you and your playing. To do this, your need to trust the teacher, and this stems from having met him and feeling confident that he is going to get you results. Find out how much experience he has and whether he can get you results by looking at their other students. And remember, you can save money in the long run by getting the best guitar teacher for you, even if he costs a bit more in the meantime. With all that, we hope this article helps you find the perfect guitar teacher for you. If you are based in London, we would love to find out if we can help you with your playing. Just click on the button below. It will take you through our contact form where we can find out a little more about you and book you in for a free introductory lesson. This lesson will allow us to find out a little more about how your playing is going, what you would like to achieve on the guitar, and how our teaching would benefit you. So click the button below to get in contact.